Additional Info: I've been playing for over 200+ venues from weddings, banquets, corporate dinners, funerals and memorial services and more! I've been playing for 7 years and currently use a Lyon & Healy Prelude 38 string harp. I try to play your favorite tunes, but the harp may not always be able to play every style. 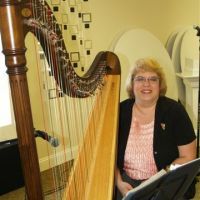 I also teach beginner harpists, so check out my teaching profile.